On the surface not much to take away from the University of Louisville women’s basketball team’s 91-56 win over UT Martin. Making it look easy, the Cardinals improving their record to 9-0. Myisha Hines-Allen leading all scorers with 16 points in 20 minutes (Cindy Rice Shelton photo). Myisha Hines-Allen would lead all scorers with 16 points, all but six of them in the first half. The only reason she didn’t notch another double-double was she was only in the game 21 minutes. 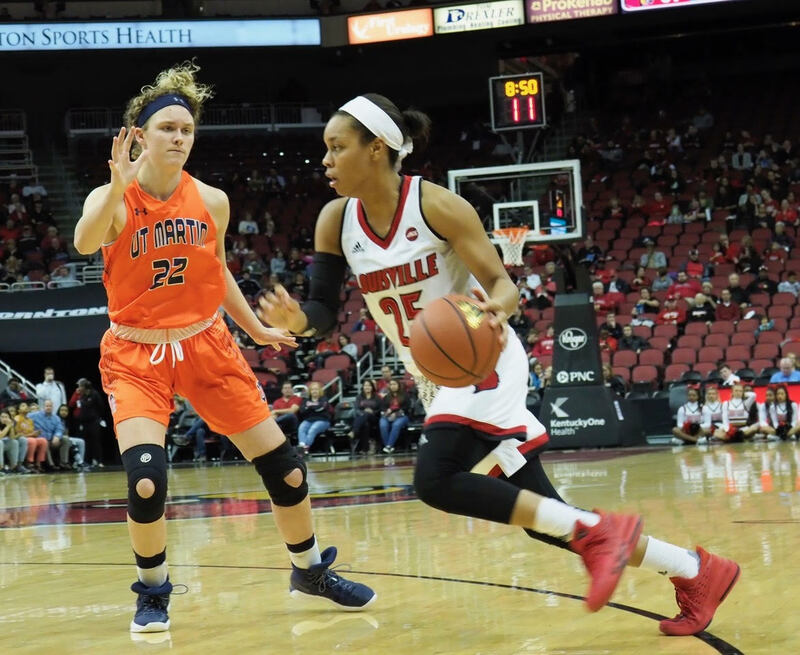 Asia Durr and Jazmine Jones would contribute 14 apiece during their abbreviated playing time. Kylie Shook getting a rare start, but the 6-foot-4 sophomore managing only two points. Having a tough time converting shots, making only one of six. She was a major factor on defense, however, grabbing four defensive rebounds while blocking four Tennessee Martin shots. Asia Durr turning in 14 points but making only four of 11 shots (Cindy Rice Shelton photo). Plenty of action from the bench again, giving the 6,279 fans at the KFC Yum! 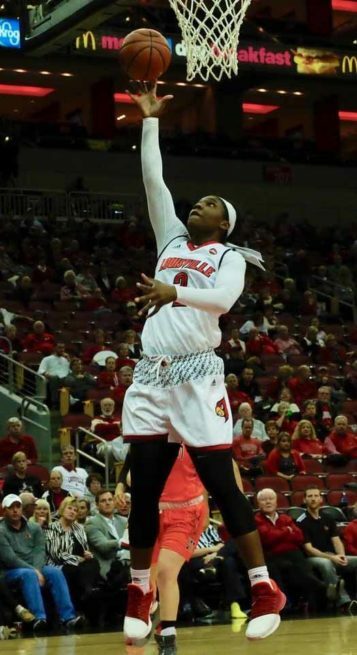 Center another good look at the depth available to Coach Jeff Walz. The more time the subs get, the more they will contribute during the upcoming nitty-gritty of the schedule. If anything else is to be concluded, it would be that freshman guard Dana Evans is a serious player. She never takes a play off and is equally intense on both the defensive and offensive ends of the court. Evans had only six points but she also had six assists and three steals to go with three fouls. 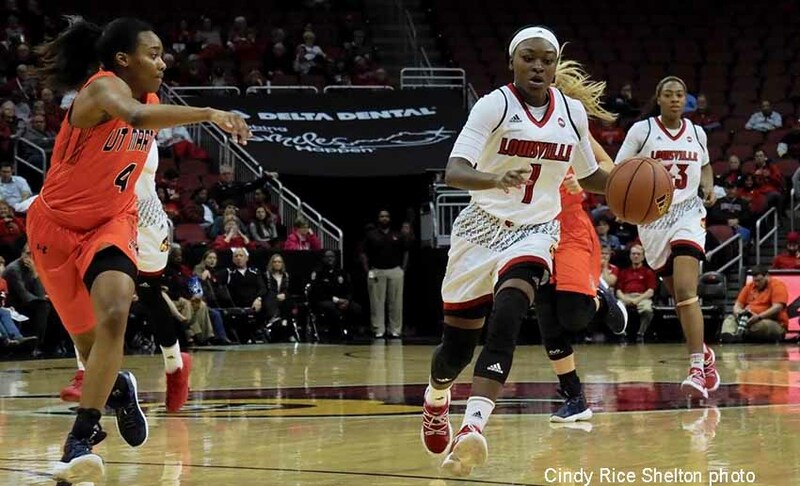 Women’s basketball and Baseball have been the shinning stars for Louisville this year.